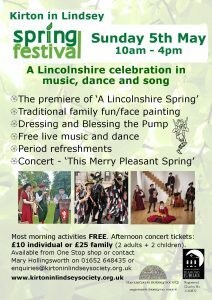 Kirton in Lindsey Amateur Gardeners and the Town Hall have combined to bring you a spring extravaganza! Don’t just look at the daffodils in your garden, bring some along and enter them into one of the competition classes. There are 14 classes of Daffodils and it will be 50p per entry. Entrants must live within 5 miles of the Market Place. Photographic competition open to all on the themes of ‘A garden scene’ and ‘A single Flower’ Maximum size A5 (7″ x 5″ approx.). 2 entries per class per person only. We will also be fundraising for Marie Curie Cancer Care. Open to the public from 9.30 as well. Error: Error validating access token: Session has expired on Saturday, 23-Mar-19 02:32:21 PDT. The current time is Thursday, 25-Apr-19 18:52:15 PDT.